Linkbuilding is an important factor of site ranking in the SERP. In our service you buy links that lead to your site. Web crawlers consider it when indexing your site and range it higher in the SERP. Big database More than 5 000 of sites are available for backlinks placement. It is easy to start working and get a result. 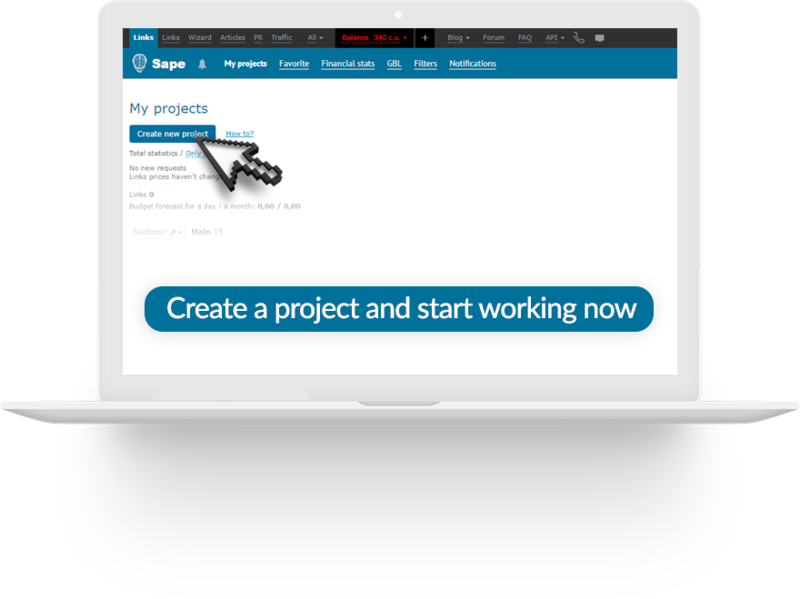 Create an account at www.sape.ru/en, top up the balance and create a new project. Then add the site that you want to promote. Create texts and anchors. Find suitable sites for link placement and buy them. In the end, using our service will increase your web traffic and conversion with the power of SEO. Ranking high for the right keywords is the way to achieve online visibility for your business. Sape will get you a steady flow of motivated customers ready to use your services. This will eventually increase your company's revenue. Link placement is an important factor of site ranging. After placing links on various sites in the relevant categories, your site will move up in SERP, taking the top positions on desired key requests. This way more users will see your site. Sape is a Russian company. But our support speaks English pretty well. Ask us anything using our feedback form. You can switch the language on the Passport page. We are proud of our support team. Sape is a large Russian IT company that works with internet advertising and marketing. Sape network has been around since 2008, and is the oldest brand on the market. While other services went bankrupt and closed, only Sape was stable and went on developing. Sape combines the power of thousands of websites all over the world. In our service, you can get great quality links placed on pages with low outbound links at a very cheap price. We are the biggest backlinks network in the world, with more than 20.000 customers and 300.000 promoting sites. We have a functional API that allows you to automate the work with our service and create a personal account for your agency to interact with your customers. It allows you to create additional value for your users and to increase your business marginality. With API you will be able to automate the interaction with our service. It will simplify your operations and will minimize time necessary for everyday routine operations.